Generation Birmingham was approached by their client to provide a vast amount of personalised powder coated barriers. 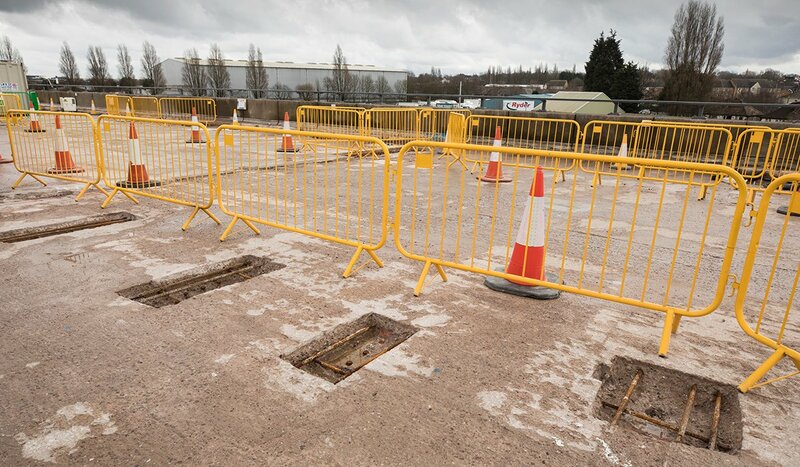 The barriers were needed to denote specific demarcation areas for Safe Zones as well as Electrical & Working/grinding areas stretching across 2 junctions of the busy M5 motorway (Junction 2 to Junction1). Due to the nature of the project and the need for flexibility when moving along the motorway, GenerationHire & Sale recommended that the client specifically used Pedestrian type barriers for ease of manoeuvrability and stacking. Our fixed leg 2.3m pedestrian barriers are lightweight, fast to assemble and very strong and versatile; making them the perfect choice for this project. The client not only invested in Generations personalised powder coated pedestrian barriers but since June 2017 have also bought powder coated walk through barriers, round top fencing panels sets for around the pillars underneath the Motorway) and RB200 Water Filled Road Safety Barriers for their main site set up. In addition to this they have hired countless amounts of Road Plates. Once again Generations ability to react to our customers needs however specific meant they were first choice when it came to supply, with the ability to offer customers what they want, when they need it most at the most competitive prices.